Flow cytometric analysis of KARPAS-299 cells, untreated (blue) or treated with hIL-1β #8900 and Calyculin A #9902 (100 ng/ml and 100 nM, 15 min; green), using Phospho-IRAK4 (Thr345/Ser346) (D6D7) Rabbit mAb (Alexa Fluor® 647 Conjugate) (solid lines) or concentration-matched Rabbit (DA1E) mAb IgG XP® Isotype Control (Alexa Fluor® 647 Conjugate) #2985 (dashed lines). Cell Line Source: Dr Abraham Karpas at the University of Cambridge. 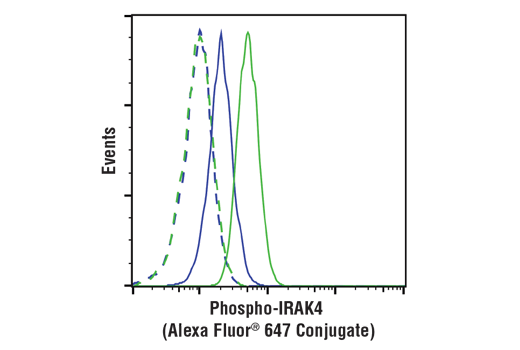 Phospho-IRAK4 (Thr345/Ser346) (D6D7) Rabbit mAb (Alexa Fluor® 647 Conjugate) recognizes endogenous levels of IRAK4 protein only when phosphorylated at Thr345 and Ser346. This antibody does not react with single phosphorylated IRAK4. Monoclonal antibody is produced by immunizing animals with a synthetic phosphopeptide corresponding to residues surrounding Thr345/Ser346 of human IRAK4 protein. This Cell Signaling Technology antibody is conjugated to Alexa Fluor® 647 fluorescent dye and tested in-house for direct flow cytometric analysis in human cells. This antibody is expected to exhibit the same species cross-reactivity as the unconjugated Phospho-IRAK4 (Thr345/Ser346) (D6D7) Rabbit mAb #11927.